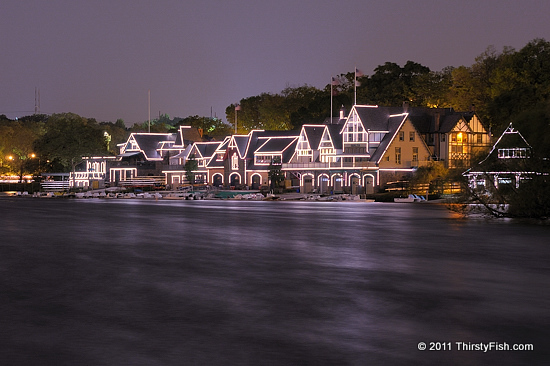 Boathouse Row is a National Historic Landmark located on the Schuylkill River in Philadelphia. The boathouses are seen as centers of the rowing community around the United States. In 1979, the houses were outlined with lights, giving them the gingerbread appearance at night. The Schuylkill River is a 135 mile river that lies entirely within the state of Pennsylvania and joins the Delaware River in Philadelphia. Schuylkill was named by the Dutch and it translates as "hidden river". Rowing on the Schuylkill River was only possible after the construction of the Fairmount Dam in 1810. The Dam made the river resemble a freshwater lake rather than the tidal river it once was.